It’s been six winters now that I’ve made the trek to the Tampa-Clearwater-Dunedin area for Spring Training assignments. • The ballparks: Quaint Dunedin Stadium, the retro Phillies Bright House Networks Field in Clearwater and a mini-Yankee Stadium at George M. Steinbrenner (Legends) Field in Tampa all within easy proximity. • Pat Hentgen’s boyhood enthusiasm: He was terrific to deal with when he pitched; he’s just the same guy now as he helps out the pitchers at Spring Training. 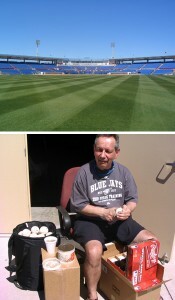 • Dave Stieb’s ever-present glare: Another great Jay here to help out. He’s mellowed somewhat but one gets the feeling he’d still be tough as nails on the mound. • The manager’s daily media chats: Now it’s Cito Gaston and before him it was John Gibbons handling those low key huddles, complete with some funny side stories. • All little kids at heart: While the Jays are doing their daily chores as big kids playing a game for little kids behind the centre-field wall the little kids are playing little kids’ games in the adjacent school yard. • How do they do it? : With the media mere feet away, the Jays find a way to block out the scribes and photogs. Batters still pound the ball and pitchers snap their tosses over the plate. I know it would bug me to have someone that close staring at my every move. • Great media access: The media is even permitted to enter the locker room with the game in progress to interview players who have been taken out of the game. • Relaxed atmosphere: Players and coaches are obliging and very much at ease. • Paul Stewart from Allentown, Pennsylvania: One of the many Phillies fanatics and a downright great guy that I’ve seen every year at my hotel which is a 10-minute walk from the Phillies complex. He’s 77 and been making this pilgrimage for 15 years. I always look forward to being regaled by his passionate stories spanning sports, the U.S. and Canada (which he’s traveled extensively and truly appreciates). • Neil MacCarl’s annual press box appearance: During his lengthy career with The Toronto Star, I read his baseball stories religiously – long before the Jays were even born. When the Majors arrived in Toronto, I was glad this baseball lifer spent his final working years with a Big-League club in his own backyard. • Baseball traditions: Len Frejlich sitting in the sunshine doing one of the game’s all-important “must” chores. Using Baseball Rubbing Mud (yes it really does exist) and a bit of water, one of the Jays charter employees and long-serving visiting clubhouse manager was preparing two boxes (12 dozen baseballs) for the next game. He says they go through eight or nine dozen per game but more are prepared just in case. Why the work on the baseballs? “To take the shine off and give them a little texture,” he says. How much mud is used? “A little dab’ll do ya,” he says using that famous jingle for those Brylcreem commercials. Then I’m thinking, if you remember Brylcreem, you’re showing your age! • Warm weather even when it’s chilly: How can people be complaining when temperatures dip into the 40s Fahrenheit and yet the sunshine makes it feel warmer to me? • Hope springs eternal: Everyone’s optimistic, everyone’s pumped. • Let’s do it again: Constant thoughts that next year will be here before we know it and if we’re healthy, how we’d love to be back and do it all over again.